මෙම කෘතිය ඩන්ටේ , ලියෝ තොල්ස්තෝයි , ඔස්කා වයිල්ඩ් ගේ සිට මාර්ටින් වික්‍රමසිංහ , සයිමන් නවගත්තේගම​, මංජුල වෙඩිවර්ධන යන සිංහල ලේඛකයන් ගේ කෘති වල මනෝ විද්‍යාත්මක විශ්ලේශනයක් අන්තර්ගතය​. මේ පොත සිංහල ලේඛකයන් සහ ඔවුන් ගේ කෘති විශ්ව සාහිත්‍යට හඳුන්වා දීමට ගත් උත්සහයකි. මෙම පොතට පෙරවදන ලියා තිබෙන්නේ ටොරොන්ටෝ විශ්ව විද්‍යාලයේ මහාචාර්‍ය මේරි සීමන් විසිනි. 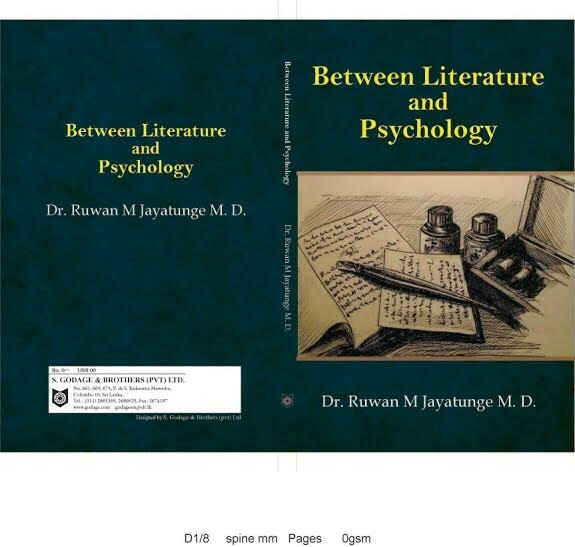 Dr. Ruwan M Jayatunge, a Sri Lankan clinician, has written an extraordinary book linking the Western literary canon (Shakespeare, Dante, Goethe, and Tolstoy among others) with psychiatry, showing how great writers are able to portray psychopathology with unique depths of understanding. More importantly, Dr. Jayatunge introduces Western readers to five Sri Lankan writers, Cumaratunga, Wicramasinghe, Jayathilaka, Navagattegama, and Wediwardena whose grasp of the psychology of human nature is unparalleled. This book should become standard reading in clinical psychology and related mental health disciplines. Professor Mary V. Seeman OC MDCM FRCPC DSc. This entry was posted on Monday, August 8th, 2016. You can follow any responses to this entry through the RSS 2.0 feed. You can skip to the end and leave a response.